Lately, I feel sad watching the news and seeing all the trouble in Myanmar. This is because I can recognize some of the places where the violence is being enacted. As some of you are aware, I spent 2 weeks in that beautiful country in September 2005. The hotel I stayed in was midway between the two pagodas shown so frequently on tv; the Sule and Shwedagon (hope I got the names right). But I am hopeful that some good will come out of this tragedy. The people of Myanmar need our prayers. For those who did not read my article about my Myanmar visit, you can read it here. 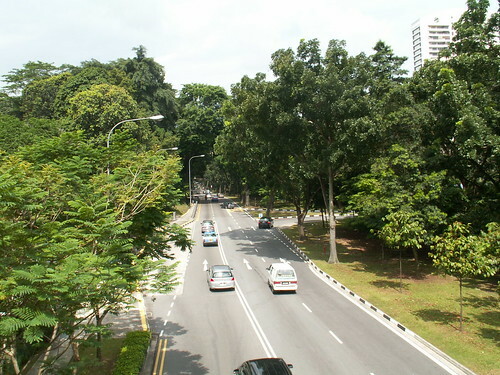 Upper Bukit Timah Road runs from Clementi Road to Bukit Panjang Road. 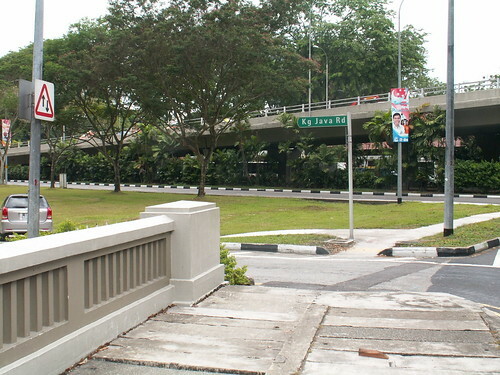 In the old days before the BKE (Bukit Timah Expressway) and Tuas Second Link were built, most Singaporeans traveling north to Malaysia would have to use this road which joins to Woodlands Road. Thus, as part of this series on the Bukit Timah Heritage Trail, I will (probably) also follow the same route and end only when I reach the causeway. Actually, I don’t know much about this area. So, in this post, I will just try to list the places that once stood here and let my regular readers – especially Peter and Chuck fill in the details. Later, in subsequent posts, Peter, having grown up in this area, will share a couple of interesting stories about the places along this trail. So what were some of the familiar landmarks as we make our way northwards from Beauty World? 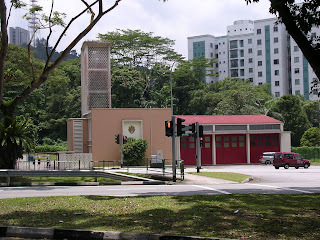 The most famous landmark here of course is the Bukit Timah Fire Station at the junction with Jurong Road. Today the buildings are still there but I think the station has shifted to a more modern station in nearby Bukit Batok new town. Just before coming to the fire station, you would pass by the Amoy Canning Corporation and another rubber factory on your right. You will also see some flatted factories near Hindhede Road. 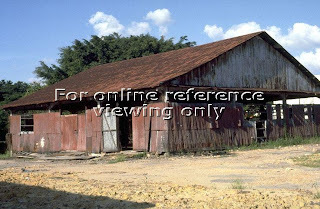 This rubber factory is smaller that Lam Choon Rubber Factory at Anak Bukit (see previous post). I found some photos in the National Archives website which I think are of this factory. You will also see a huge Green Spot bottle outside the Amoy Canning premises. Today, this stretch of road is mostly occupied by new condominiums. After Jurong Road you will pass by two famous factories on the high ground to your left. These are Ford Motors and Hume Industries. I have previously blogged about my university vacation training at the Ford factory which has been recently converted into a museum. The Hume site is now (what else but) another condo. As you passed Hillview Road, you will not miss the Chartered Bank building on your left. At night, it was especially prominent because of its brightness in contrast to the dark surrounding. This road led to the Princess Elizabeth Estate where Chuck used to live in. On the left would be the Union Carbide Factory which the locals referred to as Tian Tor Long (battery factory) in Hokkien. 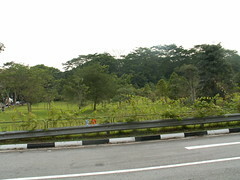 This used to be a very rough dirt track which led to the dairy farm at the foot of our highest hill, Bukit Timah Hill. I have one interesting story to share. Once I dated a girl who lived here. This was during my army days. One evening I sent her home in our family car; an old Mazda Capella. Next morning, I discovered that one of my wheel hubs were missing. You can picture how bumpy the road was. I began to empathize with those daring young men who used to date my elder sister during my kampong days. I know practically nothing about this place except that my old friend Chuck used to study at a secondary school here. The only time I came here in the old days (early 70’s) was when we had AG (anti-guerilla) Warfare training during my Section Leaders Course days in Safti. We pitched our base camp near a rubber plantation at the edge of the jungle, and each day we were sent for ‘patrols’ in the jungle. Those days, the jungle was quite ‘authentic’, and I remember crossing some streams with very clean water. At night, we slept in our bashas with our ‘wives’ (AR15) strapped to our wrists to prevent them from being stolen by our irritating corporals. Continuing our journey northwards, you will finally come to the junction with Chua Chu Kang Road and Bukit Panjang Road. There were rows of shops on both sides of the road. There was a rather busy kampong on the left just before the junction. During those last few months of my NS days in Mandai Camp, my buddies and I occasionally came here in the evenings for some makan and shopping. I seem to recall a pasar malam atmosphere and even a primitive cinema here. Strange; whenever I think of this Bukit Panjang Village, I always picture the Chong Pang Village at Sembawang. There must be some similarities. Or maybe it’s because I only visited these two places at night for shopping and makan. This is the old cinema I told you about. It's called Sin Wah Theatre. This photo and the two previous ones are from National Archives Collection. Those days, I was staying in Farrer Road. On Sunday evenings, I would to take a bus back to my camp, 30SCE in Mandai Road . I would either take a bus to Coronation Plaza and change to SBS no. 171, or I would take TIBS no. 181 right to the end of its route at Bukit Panjang, and then change to SBS no. 171. And thus we come to the end of one of the longest roads in Singapore. One quiz question before I leave. What is the Hokkien name for Bukit Panjang? It's the Mid-Autumn Festival and everybody's blogging about moon cakes; including my friends Victor and Laokokok. In that case, I'd better ……..........…. ...... not blog about moon cakes! Haha .. gotcha. I prefer to eat them! And what better way to enjoy moon cakes than in the cool of the evening with a whiff of the natural fragrance of the Moon Flower. 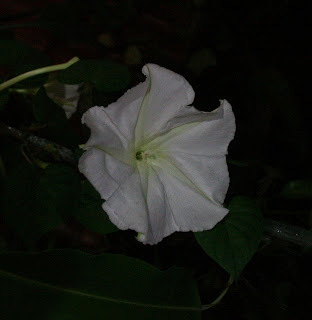 The Moon Flower (Ipomoea alba) is quite special. It only blooms at night. I read that it’s because, it wants to attract nocturnal insects like moths to pollinate it. It belongs to the Morning Glory family, but the flower is much bigger, and looks more like a hibiscus actually. Propagation is by means of seeds and it’s quite a simple plant to grow. You can plant it in a pot. Make sure it gets adequate sunlight and plant it near to something to climb because it is a climber. Someone gave us some seeds and we first planted them outside our house next to a lamp post because our garden was too crowded already. We did not expect the flowers to be so beautiful and to bloom so generously. So we planted another in our balcony. Unfortunately, the flowers will wilt once it is daylight and so it's difficult to get a good photo of the flower. But here are some photos for you to enjoy. Sorry, too lazy to mount tripod etc. so picture quality not so good. The flower opens very quickly. One minute it is still a bud, and the next (once it gets dark) and the flower is fully bloomed. I dare say, along the entire length of Bukit Timah Road, going all the way from Serangoon Road to Bukit Panjang Road, this stretch has undergone the most changes. Today, this short stretch of Bukit Timah Road is full of condominiums and more are being added even as we speak. There is even a new side road called Blackmore Drive and a new school, Methodist Girls’ School. Another condo project coming up no doubt. A shot of a peaceful looking Bukit Timah Road taken on a late Sunday afternoon. In the not too distant past, this road would have been crowded with lots of punters leaving the Turf Club at this hour. 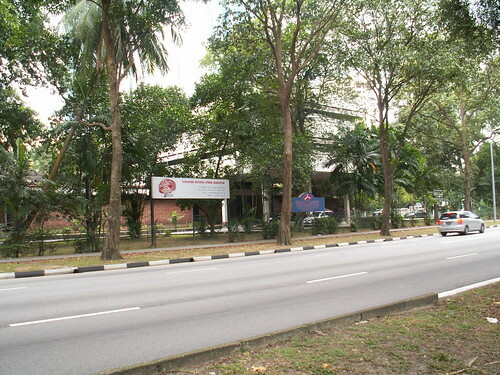 The row of trees in the middle are probably the glam trees that Dr Tan Wee Kiat wrote about here. Today there are only 4 prominent commercial complexes left; Sixth Avenue Centre, Tan Chong Motors and the adjacent Apple Computer Centre, King Albert Park and Sime Centre on the opposite side at Dunearn Road. But did you know that up to the eighties, this place was home to a number of factories and commercial buildings. Here are a few that Peter and I can recall from memory. I think this was located before Wilby Road at what is now the Tessarina condominium. The compound of this factory was very big and squarish in shape. A big, rather bare garden separated the building from the main road. A huge signboard bearing the name, Rothmans of Pall Mall could be clearly seen by passers-by. This was a printing company. I had occasion to visit it once in the eighties when I was working in NPB. I recall that the factory was very old and I saw a banyan tree growing out from crevices in the front of the building. Today Tien Wah has its own building at Pandan Crescent. These two were relatively new buildings. In 1990, I purchased my first new car, a Toyota Corrolla, from the Borneo Motors outlet here. There was also a DIY Superstore near to it. I think the location of these 2 places would probably be at the present Maplewoods condo or Blackmore Drive area. In the old street directories that I consulted at the National Library, I saw two other buildings which I am not familiar with. They are Tricity House and William Jack. I hope my readers can throw some light on these two names. King Albert Park of course is well-known for being the headquarters of the McDonald’s fast food chain and Cold Storage supermarket. Many school children like to hang out here. My youngest daughter and her friends refer to this place as KAP. Previously, this place was a bus depot. Peter has blogged about this earlier. “The factory was painted red in colour, made from zinc metal sheets and had small windows. The factory emitted a strong stench when rubber was smoked. I saw yellow coloured rubber sheets hung out to dry in the sun. On the right is an aerial photo of the Lam Choon Rubber Factory. Sorry it's quite blur; but let me orientate you. 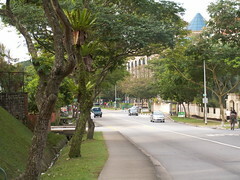 The road to the right of building, coming southwards is Jalan Anak Bukit. Yeo Hiap Seng to the right of this road. At the bottom center (buses) is Clementi Road. To its left was the old Chinese cemetery grounds, now the entrance to PIE. Bottom right is King Albert Park area behind the Green Bus Depot. 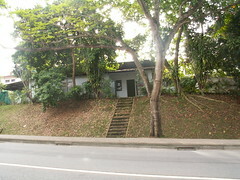 Next door was the Bukit Timah Community Centre which is now the Econ Home Nursing Services. 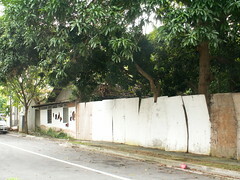 Jalan Anak Bukit was already in existence in the early 1960s but the connection to the PIE took place in 1972. Through PIE, I drove along Jalan Toa Payoh - exiting near St. Andrew's School in Woodsville - to the eastern parts of Singapore for dates; never really knowing why so many of my dates lived in that part. Lam Choon Rubber Factory was demolished by the time I ROD. I think Straits Steamship Ltd bought over the rubber factory site. 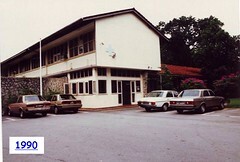 Bukit Timah Plaza opened sometime in 1978 or 1979. In 1974 there was a bank run at the Chung Kiaw Bank, a subsidiary of the United Overseas Bank. Large crowds, mainly housewives heading to the Jalan Jurong Kechil Market were queuing very early in the morning. I am not sure who started the rumour but my mother was one of those who lined up to withdraw money. The old Chung Kiaw Bank branch is now the UOB branch next to Beauty World Plaza. Bukit Timah Plaza has been around for such a long time, I think I will include it in this post. I cannot remember the Fitzpatrick departmental store which Peter says was one the earliest tenants. I only remember the Yaohan Departmental Store which was their anchor tenant for a number of years. There also used to be a CPF branch and a POSB branch. I believe it also was one of the early shopping centres with the glass cubicle type of elevators. This used to be located at the junction of Jalan Anak Bukit and Dunearn Road. In the old days it was call Yeo Hiap Seng Sauce Factory. Later it was renamed Yeo Hiap Seng Foods (or something like that). I seem to recall seeing big billboards advertising the Pepsi cola drinks. 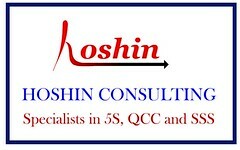 When I was working in NPB, I was involved in producing a training programme called Total Quality Process. We produced a series of videos to support this training programme and one of the series was filmed in this factory. The role of quality manager by the way, was played by the lovely Jacintha Abisheganaden. In the video, there were scenes of the packet drinks production process as well as the goods loading and unloading area. In an email, Tom also mentioned that he often visited his girl friend who lived within walking distance at Eden Park. Now, do you know were that Eden Park? Actually, Eden Park like many of the landed housing estates in this area has not changed much, other than the customary upgrading. It is located just next to the estate where I am staying, separated by a canal. This estate is made up of a number of roads that bear the names of temperate trees; such as Maple, Fir, Redwood, Elm and Cypress. I think in Tom’s days, most of the houses here were single-storey bungalows. But if you were to go there now, as I often do, for my evening walks, you will see that most of them have been ‘upgraded’ to double-storey houses. This drain separates Lucky Park and Royal Ville on the left and Villa Azura and Eden Park on the right. Not long ago, on one of my walks, I bumped into my Applied Maths teacher from NJC, Mr Lim Nai Tian. Older Hwa Chong JC students would probably know him because he was their first principal. Unlike the rest of nearby Bukit Timah Road, this railway station appears to be untouched by time. 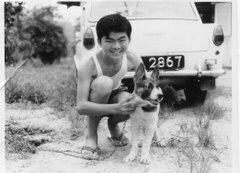 While my fellow fanatic about old Singapore places, Peter and I do some 'research' for our next post about Bukit Timah, here's a 'grandfather story' from my brother Chun Chew to keep you entertained. I had an uncle who stayed in Malaysia and got married during the Japanese occupation. His wife bore him seven daughters in a row. After giving birth to the last daughter, my uncle was rather disappointed because he wanted a son very badly, seeking agreement from his Peranakan wife to give away his last daughter to his elder brother, who himself had several kids. His elder brother was quite happy to adopt this lovely baby girl, but my aunt was so distraught missing her child that she could not sleep at night, crying bucketful of tears for her daughter. Being a forceful lady, she demanded that her husband to take back the baby from his elder brother, who just lived next door. Having seven daughters was not a problem financially, as my uncle was quite a successful businessman. Next year the couple was lucky with the arrival of a son. Time flew. The kids had all grown up. What happened to the last daughter? She was the brightest of the lot and did very well in her studies. She graduated with flying colours from a top Australian university, got married to a very successful architect from Malaysia, who himself was also a top scholar. Both obtained scholarships to do post graduate studies in the US. Later on when they returned to Malaysia, the husband was involved in planning many large building projects and she herself holding a high position in the private sector. One day I met my uncle in Farrer Court and he told me that this daughter and her husband are very filial to him and his wife. They sponsored my uncle and aunt to visit the US, Europe and many other places, showering them with unconditional love. This story reflects some core human values. Namely a mother’s intrinsic love for her child who is irreplaceable, an important role a daughter can play in a modern society and the love of ones parents is a moral commitment. Thanks to Flickr member cromacom for the use of above photo for illustration purpose. Today, I would like to make a short detour and talk a bit about Sixth Avenue, an area in which I have been staying for the past 21 years. If you traveled along Bukit Timah Road from Hwa Chong Institution towards Clementi Road, you will pass a number of side roads that go by the names First Avenue, Second Avenue and so on. The most famous of these is Sixth Avenue. By the way, you won’t be able to see Fifth Avenue because it is actually off Sixth Avenue and not Bt Timah Road. Recently, Sixth Avenue was in the news for the wrong reason. Two United World College students were killed in a tragic accident when their sports car crashed into a wall and burst into flames. Prior to 1986, I seldom used Sixth Avenue. The only thing I knew about Sixth Avenue then was that there was a very steep slope at the junction with Holland Road, and your clutch control skills would be severely tested if you had to stop there. In those days, there were very few cars with automatic transmission. Question: Now I want to test your knowledge of this part of Singapore. Have you heard of a place called Race Course Village (and not Bukit Timah Village as I said earlier)? Do you know where it was located? Where I am staying now is a small estate made up mainly of terrace houses and semi-detached houses. An interesting feature about this estate is that all the roads are named after flowers beginning with the letter L. It’s such a small estate, I think I can rattle off all the names - Lily, Lantana, Lasia, Lemon and Lotus. The proper name of this estate is Lucky Park; but somehow nobody uses the name. Did you know that before this estate was built, it was a village by the name of Race Course Village? I stumbled on this interesting fact when I was looking through a 1969 street directory recently. When I first moved here in 1986, Royal Ville, which is directly in front of my house was just being constructed, and it was a big nuisance for us during the first few years. At that time, there were still a couple of kampong houses remaining right at the end of Lily Avenue, next to the big drain. But today there is only one kampong house remaining. Yes - I am not pulling your leg. And here’s the proof. Well actually two if you included this one which is just across the road. One of the most prominent landmarks of Sixth Avenue today is the Guthrie House with the Cold Storage Gourmet supermarket on the ground floor. Next to it are two new condos by the names of Fifth Avenue Condo and Sixth Avenue Ville. Do you know what was here before? It used to be a furniture factory and showroom by the name of Actus. After Actus moved out, it was occupied briefly by another furniture company called Novena. Did you know that there used to be a Chinese cemetery along Sixth Avenue? Off Sixth Avenue, somewhere midway between Bukit Timah Road and Holland Road is a short little road called Lorong Panchar. There used to be a Chinese cemetery here, and next to it was a nursery called Evershine Nursery. Today, both the cemetery and nursery are no longer there. It’s just a green field (see photo below). 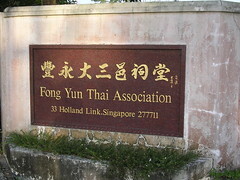 But a short distance away, at Holland Link, there is still a private columbarium call Fong Yun Thai Association Columbarium. Like many parts of Singapore, Sixth Avenue has undergone much change during the past 20 years. For one thing, the traffic is so heavy nowadays. There are many new condominiums here and even a new road that goes by the very exotic name of Laurel Woods Avenue. But one good change was the relocation of the nearby Turf Club to Kranji bringing with it those irritating weekend traffic jams and even more irritating punters who liked to park their cars in our estate and litter and speed. For some reason, they liked to arrive late and leave early. 1) A nice arial photo of Bt Timah area showing the old Turf Club can be seen here at a document called BUKIT TIMAH 1993 Planning Report by the URA. With a bit of help from my friend, Peter, I would like to tell you about the final stretch of Bukit Timah Road from Newton Circus to Tekka at Serangoon Road. Did you know that the nice and peaceful Kampong Java Park, reputedly a favourite ‘haunt’ for love birds at night used to be a cemetery? 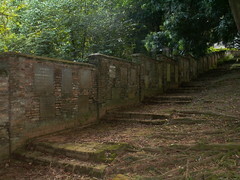 The graves here were previously located at Singapore’s first Christian cemetery. Do you know where that was? I recall seeing the road sign for New Cemetery Road whenever I traveled past this park in the old days before the Central Expressway was built. In writing this blog, I had a tough time confirming the exact location of this road. It could not be found even in my 1998 street directory. I checked two books on Singapore road names at the National Library and both did not list this street. Finally, with the help of National Library's ASK service, I was able to confirm that this road known as New Cemetery Road did not exist simply in my memory. I must say a word of thanks to the National Library Board’s reference librarian, Ms Hameedah M Ibrahim for her assistance. Next to Kampong Java park is one of those irritating Area License booths. In those days, before the advent of the ERP system, we had to stop our cars by the booth, get down, purchase an area license and stick in to our windscreen. For the younger readers who are not familiar with this system, you can refer to the references in my previous post. I think most of you would know about this famous hospital. It’s the predecessor of KK Women’s and Children’s Hospital. For some reason, they decided to adopt a new name when they shifted to the present location. Did you know that this hospital used to hold the world record for delivering the most number of babies. Read about this at NLB’s Infopedia (Reference 2). Most of the guys of my generation made our entrance into the world at this place. When I visited my sister-in-law at KK back in 1972 after she gave birth to my eldest niece. I saw a huge silver Rolls Royce in the car park. Do you know who it belonged to? Answer – President (Dr) Benjamin Sheares, our second president. Apparently, even though he was our head of state, he continued to practice his craft. 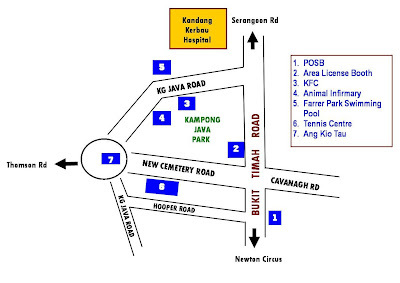 Further down, you will come to the Tekka Centre at the junction with Serangoon Road. This familiar market and hawker centre was for a time renamed Zhu Jiao when the government got carried away with it’s zeal to get Chinese Singaporeans to ‘chiang chua ji” (speak Mandarin). But for the sake of the tourists, they have reverted to the old name. Across the canal, at the Junction with Selegie Road was one of the oldest cinemas in Singapore, the Rex Theatre. I can think of three landmarks that had been removed to make way for the new KK Hospital. First there is the Kentucky Fried Chicken Restaurant. 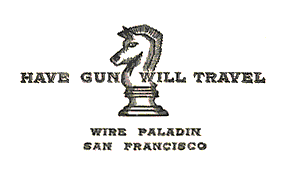 I think it was one of their earliest outlets. The first one by the way, was at Sommerset in Orchard Road. In those days, they served you the chicken on proper plates and with proper cutlery. Next to the KFC were some squash courts. I cannot remember if it was to the right or left side. In the late 70’s and early 80’s squash was extremely popular in Singapore. I was the squash convener of the Philips (Audio Factory) Sports and Recreation Club. I had to search all over Singapore to book squash courts for our weekly games. I think the squash courts here were operated by the Singapore Sports Council. The design was terrible. The entrance into the court was very low and you had to crouch down to get in. I will blog about this game at another time. Further down towards Thomson Road was the City Council Infirmary for Animals, which also housed the Veterinary Laboratory. This had been around since 1962. 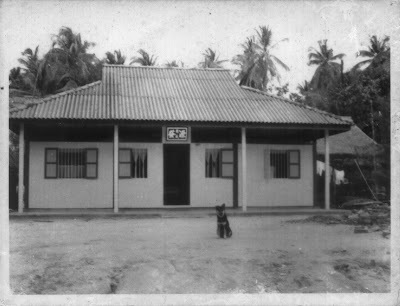 During our kampong days, we had to apply for dog licenses here. When our pets were injured, this was also the place to bring them for treatment. The next time you travel from Thomson Road to Keng Lee Road or Kampong Java Road, look out for the railings along the canal at the traffic lights junction. You will notice that they are painted red in colour. Do you know why? It’s because in the old days, this place was a prominent landmark known as Ang Kio Tau in Hokkien. It got its name from the prominent red colour of the bridge railings. I guess, they have decided to retain the red colour as a tradition. During my primary school days (early 60’s), I often went to Farrer Park Swimming Pool. We would tell the bus conductor, Ang Kio Tau. My brothers and I have some fond memories of the Farrer Park area. There was one occasion when we spent a few days of our holidays staying with our cousins in Dorset Road. My cousins used to stay in what was known as Dutch houses along Dorset Road. It was within walking distance of Farrer Park. The houses were of quite unique design, but unfortunately, I am not able to find any information about them on the internet or the Library. In 1984, I started work with the National Productivity Board located at Cuppage Centre in Orchard Road. At that time we were part of the Ministry of Labour (name changed to Ministry of Manpower recently). Within NPB, there was a unit known as the Occupational Safety and Health Unit. They were housed in Halifax Road next to the Kampong Java Park. Occasionally, I joined my colleagues for a jog here in the evening. When NPB was transferred to the Ministry of Trade and Industry, my colleagues at the OSH remained in MOL and thus we parted ways. Later, MOL got their own building at Havelock Road, and we got ours at Bukit Merah Central. Finally, we come to the other side of New Cemetery Road. Originally the Christian cemetery that I mentioned earlier stretched till Hooper Road. But this was later converted into a squash and tennis centre. Along Hooper Road were some old houses also of quite unique design. I think some of them are still standing there, but may have been converted to offices. My father’s old friend, who we called Uncle Tham used to live here. My older brother Chun Chew (Zen) will remember more because he was good friend with one of the older Tham boys. But I remember attending a Christmas party at their house once when very young, probably below seven. I think they were Christians. It was quite an experience for me as a kampong boy to mix with such ‘civilised’ (English-speaking) people for a change. I remember Mrs Tham as a very friendly lady who spoke very good English. I also remember playing musical chairs and even got a box of picture/letter cubes as Christmas present. It was a wooden box with a sliding cover on top. Coincidentally, when I moved to Lily Avenue in 1986, I discovered that Uncle Tham lived at the adjacent street; same house number as mine too, along Lemon Avenue. But shortly after, they moved away, and we lost touch. I would like to end with a Quiz Question. Where was Singapore’s Jewish cemetery located? I doubt anyone younger than 50 will know the answer. So I give you a hint: it was less than 2 km from Ang Kio Tau. I left out two items in my previous post – ACS and the Fringe Car Park. ACS was left out because, unlike Whitley and Swiss Cottage, it is still there, but then I realize there has been some interesting changes from 1960’s. As for the fringe car park, I simply forgot. The piece of land occupied by the Raffles Town Club used to be a huge car park. It was built as part of the failed Park-and-Ride scheme which was introduced as part of the Area Licensing Scheme of 1975. To encourage people to take public transport into the Central Business District, the government set aside some big car parks outside the CDB. The idea was for you to park your car there and then take a shuttle bus to work. Besides this one, I can think of two others: one at Dempsey Road, where the former CMPB (Central Manpower Base) was, and the other at the National Stadium. 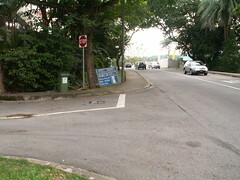 See photo of the fringe car park at Dempsey Road on the right. The scheme turned out to be not very popular and the car parks were largely empty. They became better known for their durians stalls. In 1999, the ACS campus at Dunearn Road was being rebuilt. 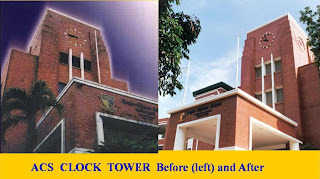 At that time there was a great deal of protests against the tearing down of the iconic clock tower which held a special place in the hearts of many generations of ACS old boys or ‘ACSians’ as they called themselves. During the few years of construction, the primary and secondary school were relocated temporarily to other campuses. My son was studying in ACS Primary and they had to shift to the school building at Ah Hood Road. I believe it was previously occupied by Kuo Chuan School. Let’s see now. What can I tell you about the old ACS campus that was different from today. Well the biggest change as visible from the outside was the removal of the Barker Road Methodist Church. Previously, it was situated just beside the school, to its left side. There was a narrow winding road that led up to the church from Dunearn Road. All my years in ACS, I never step into the church grounds, even though I was often curious about what it was like inside a church. The other big change was the removal of the huge field and car park next to the main road. It is now occupied by a multi-storey car park and building. I have been to the cafeteria there a couple of times to meet up with old school mates, but I have never been inside the new campus. But I am really glad I did not make the same mistake with ACS as I did for NJC. For many years, I lived near to the old NJC campus at Linden Drive. I often drove pass it, and still do; and had thought of dropping in just to see how the school was like. But being the procrastinator that I am, I never did. Then one day, as if overnight, the NJC campus was gone and in its place stood a completely new school; the Nanyang Girls School. That was my big regret. So when the time came to register my son for primary 1 class at ACS, I took the opportunity to wander around the premises and try to recollect what it was like all those long decades ago. I made a special effort to explore the clock tower. One particular block brought back memories of a funny incident that happened when I was in Secondary 2. The year would be 1966. At that time, the school had a strange system whereby during the morning session, it was occupied by ACS but for the afternoon session, it was occupied by a Chinese school. One afternoon, I had stayed back after class for some reason. Suddenly I had an upset stomach and needed to use the toilet. And so I rushed back to the toilet next to my classroom in Sec 2C. After ‘doing my business’, I had to walk pass my class to get out of the block. I noticed many of the student laughing as I walked pass. Do you know why? The Chinese school which occupied our premises in the afternoon was a co-ed (mixed; boys and girls) whereas ACS was a boys school. Apparently, our toilet automatically became a girls toilet during the afternoon session! You should feel privileged because you are the first people to hear this story in more than forty years. Household Name's latest post about some funny stories of bad translation reminds me of this joke. When President Nixon first visited China, he and the First Lady were introduced to Chairman Mao Tze Tung and his wife. NIXON: You have a lovely wife. MAO: (looking shocked): 不见得, 不见得. Interpreter: Cannot see, cannot see. 出卖大日本, which meant "Betray the great Japanese empire (dai Nippon)"! Actually, the same words when read in the other direction say; "Big sale today". Man, Woman, Birth, Death, Infinity. A solemn voice reads out these words as a hand writes the symbols on a blackboard. This was the iconic introduction of every episode of the medical drama series, Ben Casey (which you can now see on YouTube here), a very popular programme shown over RTS, or Radio and Television Singapore in the early days of black and white television. And it was one of my favourites. Its rival was Doctor Kildare, which starred the dashing Richard Chamberlain. Television made its debut in Singapore in 1963, the same year we merged with Malaya to form Malaysia. Initially, there were only two channels – Channels 5 and 8. At that time, in our kampong, there was only one family which had a television set. The owner, a Mr Low Thiam Aik would place his television outside his house for all the neighbours to watch. Transmission hours were from around 6 pm to midnight. Some of us even brought along stools to sit down in front of his courtyard to watch television right until the time when they played the Majullah Singapura. Subsequently, more households began to own their own TV sets. When our 7th Uncle who lived nearby to us, bought one, we switched to his home. Not much later, we too acquired our first TV set. Like my uncle’s, ours was a Siera. Let’ see now. What are the some of the favourite programmes that I can recall from those days. I think the most popular programmes with us boys would be the cowboy Westerns. The two most popular series were Bonanza and The Big Valley. These two shows had some similarities. Both centred around families with 3 brothers and good-looking male stars. Lee Majors was the heart throb from Big Valley whilst Bonanza had their Michael Landon. Bonanza had its patriarch in the person of Lorne Greene whilst The Big Valley had its matriarch, Barbara Stanwyck. Other cowboy shows I enjoyed were Have Gun Will Travel, Maverick and Gunsmoke. The children’s favourites were cartoons and animal shows. We loved those cartoon characters like Tom and Jerry, Daffy Duck, Woody Woodpecker, Huckleberry Hound, Bugs Bunny and so on. Of course there was also the Walt Disney show. When my children were small, I used to buy some VCDs of these old cartoons for them to watch. Somehow, I felt they were more wholesome compared to the modern cartoons. As for the animal shows, I can remember three. They are Flipper, Lassie and Rin Tin Tin. Then of course there were the detective/crime series. The earliest ones I can recall were Everglades and Sea Hunt which starred Lloyd Bridges. Later ones included Starsky and Hutch, Streets of San Francisco which starred Michael Douglas. 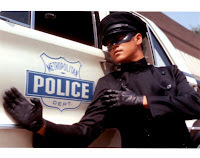 The most popular one was Hawaii Five-O, which starred Jack Lord. It had a very catchy title tune played by the Ventures. Like the tune from Bonanza, it became a big hit in the pop music charts. Speaking of detective/crime TV shows, there is one from the black and white era that I think even the teenagers of today might know. It starred the legendary Bruce Lee in the supporting role of martial arts experts Kato. The show of course was The Green Hornet. Although in each episode, our real hero of the show only got to display his lightning-fast moves for hardly one minute, it was the highlight for us. I remember one particular episode where he got to fight a karate expert. In their first encounter, the bad guy sneaked up on him, bashed him up and slammed him into a huge dust bin. His ego was thoroughly bruised. But of course, at the end of the show we got to savour their showdown where he had his chance to vindicate himself. We even had a spy series called The Man from U.N.C.L.E. starring Robert Vaughn as Napoleon Solo and the handsome-as-devil David McCallum as Illya Kuryakin. There was another one that I think many of you younger readers will know. Can you guess the title? I give you a hint. Not longer ago it was made into a successful movie starring Tom Cruise. Yes, it’s Mission Impossible. But, not all the good shows were from U.S. The British gave us the ever popular The Saint starring the debonair Roger Moore as Simon Templar. TV is incomplete without comedies and sitcoms. I Love Lucy, The Jack Benny Show, The Flying Nun which starred the evergreen Sally Field, Mr Ed the Talking Horse, Green Acres, Bewitched were some of the familiar titles. There was an interesting time travel series called It’s About Time. But my favourite was Get Smart. And then of course there were the hilarious Three Stooges and Little Rascals. I have always enjoyed legal dramas. Back then the most famous lawyer was Perry Mason. Others included The Defenders and Owen Marshall. I liked Owen Marshall because the stories usually involved controversial issues. For example, there was one episode where the court had to decide whether or not to force a mentally-retarded girl who had been raped to undergo an abortion. Such dramas helped me in my General Paper. We also had Scifi. You must have heard of Star Trek. The original series was shown in black and white and the main character, Captain James Kirk was played by William Shatner. Two other famous ones which were partly Scifi and partly supernatural, psychological thrillers were The Outer Limits and Twilight Zone. There were lots more; and I have not even talked about the Chinese programmes on Channel 8. Heard of Wang Sar and Yeh Fong? But I must mention The Samurai which was popular not only in Asia but in the west as well. The hero was one Shintaro. Try to picture him doing battle with ninjas and their deadly star-shaped darts. So if you young readers think that your parents’ days were ‘dullsville’, think again. Even though we did not have pc, or internet, there were lots of good TV shows to keep us entertained. And I should add that ‘parental guidance’ was not necessary then because most of the shows were far less violent and sexual in content. Continuing from my previous post on the Bukit Timah Heritage Trail, my friend Peter Chan and I would like to tell you about a few more interesting places that used to be located along this part of Bukit Timah. Peter’s comments are in black. Do you know where is Floral Mile? I think many of the younger readers would probably answer; Thomson Road. Wrong - because I am talking about yesterday as in the 1960’s and 70’s, not 21st century Singapore. Thus I am actually referring to the original Floral Mile at Dunearn Road. 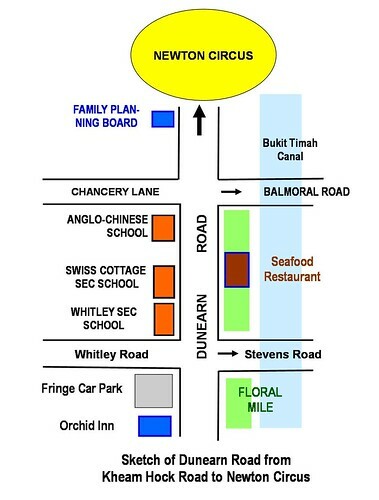 The stretch of Dunearn Road from Kheam Hock Road to Chancery Lane was known as Floral Mile. Do you know why it was given this name? Same reason why you said Thomson Road - because along this stretch of road, next to the Bukit Timah Canal, there used to a number of nurseries. But they are no longer there. I cannot remember when they moved out. But I think it must be in the eighties when the Bukit Timah Canal was widened as part of the flood alleviation project in the Bukit Timah area. Where have they been relocated to? I don’t know; but I suspect a couple of them have been relocated to the nearby Dalvey Estate and Evans Road area on the Bukit Timah side. When I first moved to Bukit Timah Sixth Avenue in the mid-80’s, I often patronised a nursery called Evershine located near the junction with Jalan Haji Alias. Was this one of the relocated ones as well? I also remember there was also a Seafood Restaurant opposite the Swiss Cottage School. I think I had a dinner there once with my colleagues at Philips. That must be in the late 70’s or early 80’s. In the photo below, Swiss Cottage School would be on the left and this restaurant on the right. I cannot remember if it was before or after the U-turn. Two nurseries I remember were “Rose Garden” (must have been named after Rose Garden of Bangkok) at 91 Floral Mile, Dunearn Road, tel: 531621, and “Corona Florist” who are still in business at Clementi Road, near the SIM campus. When the government promoted “Tree-Planting Day”, my father and I came over to buy of fruit trees and flowering plants at S$1 a “pot”. The “pot” was actually the plant with black earth wrapped in a plastic bag and secured by raffia. Plants then were not placed in clay-pots like today. Some of the popular plants included rambutan, chiku and bougainvillea. Corona Florist also helped us when we were at SAFTI OCS. They donated plants and shrubs when I was in charge of the flower-garden at “Charlie Company”, so that name is always on my mind. From far away one can notice this seafood restaurant because of a neon advertizing signboard mounted on the building facing Swiss Cottage School. It was the logo of a giant lobster which flashed intermittently and changing colours from blue to red. Opposite the seafood restaurant and beside Swiss Cottage Secondary School was a government out-patient clinic up on a hill (now a jungle). 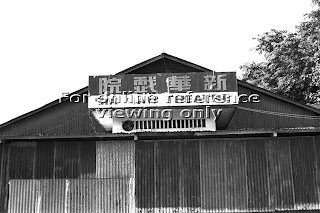 It was opened in 1966 I believe and was popular among the Malay squatters who lived nearby in Whitley Road and Keng Chin Road. From the main Dunearn Road, there was a flight of concrete steps up to the hill to this clinic. There is a pair of concrete pillars on the side of Dunearn Road and at the foot of the hill to indicate where this foot-path was. 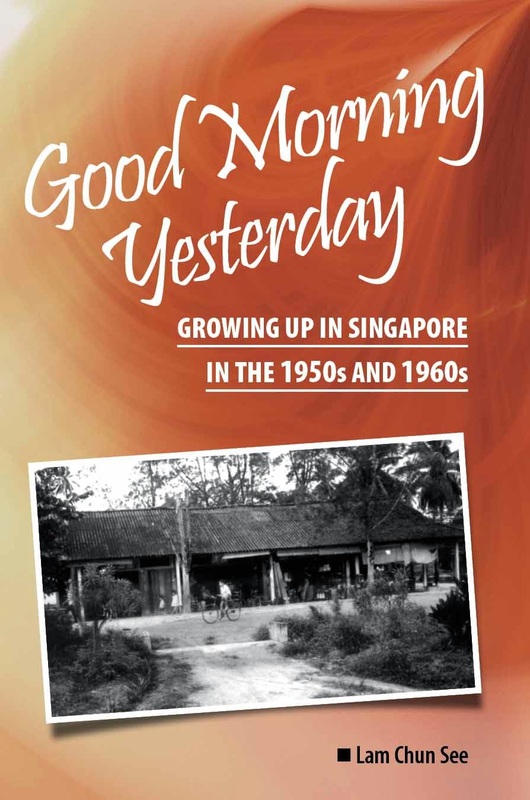 When I was studying at Anglo Chinese School in the sixties, my elder brother Chun Seong and I used to walk practically every afternoon, after school from our school to Newton Circus to take the Tay Koh Yat Bus back to our home in Lorong Chuan. I think it was service number 9A. The bus stop was at Scotts Road. We used to take the bus together with a couple of our school mates. One was David Wu and the other was Ong Leong Chye. They stayed in Serangoon Gardens. The most prominent landmark around Newton Circus in those days was not the hawker centre. I believe the world famous hawker centre was not built yet in the sixties. I say world famous because when I was in Tokyo in 1985, I met a lady who ran a stationery stall at the Tokyo International Centre where I was lodging. When she heard that my colleagues and I were from Singapore, she immediately said that she had been to Singapore before and mentioned eating at Newton Hawker Centre. 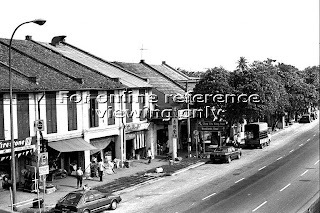 The most prominent landmark around Newton Circus in those days was the Newton Circus Post Office (not sure of exact name) Next to it was a very famous Char Kueh Teow stall. Char Kueh Teow stall in those days used firewood for cooking. 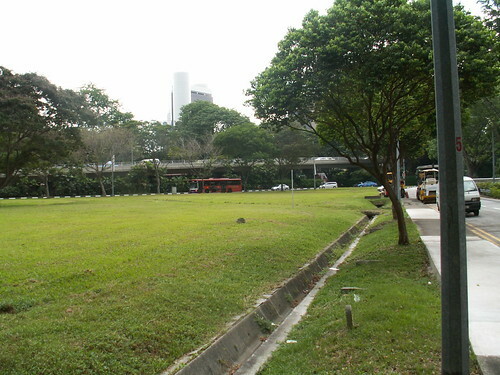 In the photo below, you can see that the area is now an open field between Kampong Java Road and Bukit Timah Road as it exits from Newton Circus. There used to be a row of shops along this stretch of Bukit Timah Road. Mind you, in those days there was no flyover and so this area was probably bigger. If I am right, Newton Hawker Center was built in the late 70s after the open-air Koek Road hawker center opposite Orchard Road Market was shut-down. Opposite the Newton Hawker Center were two primary schools; a Malay school (building still there opposite the overhead pedestrian bridge) facing Scotts Road and the Anthony Road Boys School. 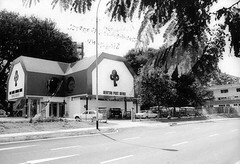 There was also the Singapore Girl Guide Association building there opposite Peck Hay Road – now a childcare center. You might have heard that our government used to be very fond of organizing campaigns. During the early years of our independence, we had the Stop at Two Campaign. The slogan was “Two is enough. The more you have, the less they get”. The statutory board responsible for the population policies was the Family Planning and Population Board. It was located at this building next to Gilstead Road. Today it houses the Breast Cancer Foundation and Singapore National Stroke Association. Back then, we often passed by it on our way to Newton Circus. I also remember seeing lots of longkang guppies in the Bukit Timah Canal. #25 Gilstead Road has history. It is now a childcare center. It was built pre-ww2 and served as the German Navy HQ when the Japanese occupied Singapore and collaborated with the Germans. Sometimes, when we were too lazy to walk, we would take bus no. 8A from the bus stop next to Chancery Lane. Maybe the real reason was because we wanted to ‘rub shoulders’ with the girls from Anderson Secondary and Raffles Girls School. You see, bus 8A went along Stevens Road, Balmoral Road, Dunearn Road, Newton Road and Thomson Road. By the time 8A came to us, it was always very crowded. 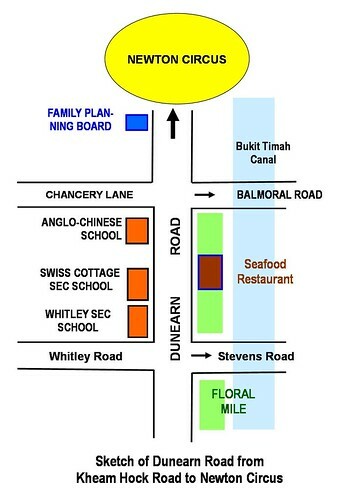 We would alight at Thomson Road opposite the present Novena MRT station and change to 9A. Another reason could be that we wanted to accompany my friends Simon Chu and Ng Kah Hwa who lived at the block of flats at the junction of Thomson Road and Moulmein Road. As for Chancery Lane itself, except for the condos, it was very much the same as it is today. On those few occasions when we used this road, we would admire the beautiful bungalows there. 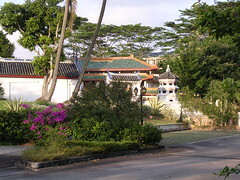 One particular bungalow had beautiful Chinese-style pavilions and red-seal palms in its sprawling garden. I remember one occasion when our school had a fun fair to raise money to build the Shaw Pool and sports complex. (which I never got to enjoy because I left shortly to join NJC), We went from house to house to sell fun fair tickets. My friend and I were assigned to Chancery Lane. One bungalow house I can never forget has a police guard-post. It was a one-storey house located just after the bend. It belonged to the late foreign minister S. Rajaratnam. The other house was a “Dutch-styled” house behind the 7th Day Adventist Church. It was my dream-house as a child. I promised one day “when I make it there”, I will live in one but sad to say I am still living in my dreams. a) When did the nurseries moved out of Floral Mile? Where are they located now? b) When was Newton Hawker Centre opened? c) When was the Newton Flyover completed?